Since 1992, Mali’s democratic constitution and policies of economic liberalization and political decentralization have expanded political participation and spurred economic growth. The annual rate of economic growth of 4-5% exceeds the median growth rate of Sub-Saharan African countries (2.5%), and agriculture and associated sectors, such as livestock and aquaculture, represent 37% of the GDP in Mali. The population is growing at an annual rate of 2.4%. About 70% of the population is rural and while small scale irrigation is increasing, households rely heavily on rain fed agriculture and pastures for livelihoods. Disputes between farmers and pastoralists over access to land and other natural resources are common. Sedentary farmers and transhumant pastoralists clash over issues of resource access and damage to crops, inheritance rights, and rights of access to water and pasture. Decentralization of some of the authority over land and water rights, especially in regard to pastoral and irrigation resources, has in some cases strengthened local democratic decision-making, it has in other cases furthered confusion and conflict where decentralized national policies clash with traditional rights and restrictions. The Pastoral Charter of 2001 and its 2006 implementing decree are key to providing pastoralists with rights they have long been denied. For full implementation of the Charter, donors should provide financial and technical assistance to the Government of Mali for revising other legislation to be consistent with the Charter, training programs for local and regional officials, and public education programs for pastoral and farming communities so they understand their rights in relation to each other. Mali has undertaken a number of reforms to provide agribusinesses with special land-tenure options, tax breaks, water-fee waivers, etc. Smallholder farmers still have relatively limited options in land tenure, especially on irrigated farmland, where their tenure is particularly insecure. Donors should support research into the causes of tenure insecurity for smallholder farmers, as well as into understanding how smallholder farmers use lands held in common. Analysts of West Africa agree that a private land market has not developed spontaneously in rural areas, due in part to traditional social systems. However, urban and peri-urban areas have seen an increase in land titling and registration. In peri-urban areas, the market has been fueled by urban expansion and increasing demand for land. Mali’s investment climate would benefit from a more predictable land market for both domestic and foreign investors. However, the evidence thus far suggests that the way in which the land market currently operates is further marginalizing the already vulnerable. Donors could take a lead in helping Mali shape its land market institutions to protect the rights of smallholders and users of common lands while still responding to the requirements of private investors. Donors could also consider directly assisting groups in understanding how to secure their customary land rights when negotiating with potential investors. The Government of Mali acknowledges its lack of progress in securing women’s rights to land, despite having fairly gender-equitable policies and laws. It appears that local and international NGOs are making headway in helping women use existing laws to secure their land rights. Donors could assist groups in scaling-up these activities. Mali is a landlocked West African country with an economy based on cotton, gold and livestock. Mali ranks as one of the least developed countries in the world. In 1992, Mali adopted a democratic constitution and policies of economic liberalization and political decentralization. Mali recognizes private land ownership secured through land titling and registration, but the vast majority of titled land is in urban and peri-urban areas. Very few smallholder farmers or agro-pastoralists own the land they work. Untitled land is considered owned by the state; almost all rural land is technically under state ownership with customary use-rights exercised by sedentary farmers, agro-pastoralists and transhumant pastoralists. Most urban residents do not have formal rights to their land and their tenure is highly insecure, which contributes to the lack of investment in housing and other improvements to the land. Over 90% of Mali’s urban population lives in slums, without formal legal rights to their land. Seventy-one percent of the urban population lacks household connection to improved drinking water, and 22% of the urban population lacks access to any form of improved drinking water. Forty-one percent of urban households lack improved sanitation coverage. The urban population is expected to grow 4–5% annually in the near future, increasing pressure on peri-urban lands and informal settlements. Conflicts over access to land and natural resources are a problem throughout Mali. Sedentary farmers and transhumant pastoralists clash over resource access and damage to crops, generations of farmers dispute inheritance rights, and pastoralists vie for primary rights of access to water and pasture. The Government of Mali (GOM) has decentralized some of its authority over land and water rights since independence in 1992, especially in regard to pastoral and irrigation resources. In some cases this has strengthened local democratic decision-making, but in many cases it has furthered confusion and conflict, especially where decentralized policies clashed with traditional rights and restrictions. Ambiguous water rights have caused land users to dig wells in order to strengthen their claims over land and resources. As the government has implemented various public irrigation schemes, land values have increased, feeding competition and disputes that are often resolved at the expense of the most socioeconomically vulnerable. Forests and wooded lands cover nearly a quarter of Mali’s land area, but are disappearing at the rate of 0.8% per year. The greatest threat to the forests has been demand for firewood, which is the primary source of cooking and heating fuel for the majority of Malians. Although the mining sector occupies an increasingly large share of Mali’s economy, it has been widely criticized for corruption and for creating hazardous conditions for workers, local communities, and the environment. Income from mining is often not equitably distributed. In addition to precious metals, semiprecious stones, rock and gravel, Mali’s assets include a vast reserve of undeveloped mineral resources. Mali is a landlocked country of 1.22 million square kilometers of land and 20,000 square kilometers of lakes and rivers. The country’s total population was estimated at 12.7 million in 2008, growing at an annual rate of 2.4%. About 68% of the population is rural and nearly 79% of the active population engaged in agriculture. 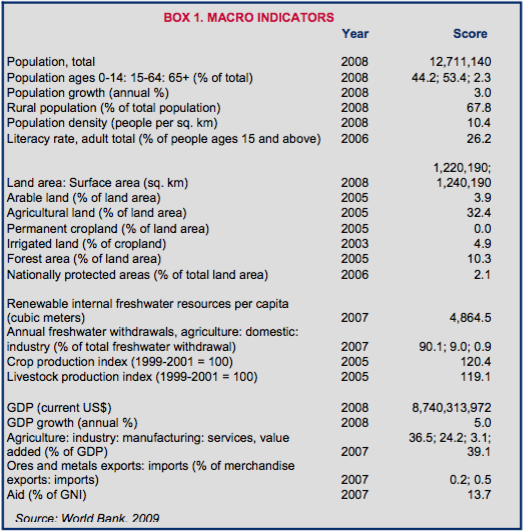 In 2008, the GDP was US $8.7 billion, of which agriculture constituted 37%, industry 24%, and services 39%. The annual rate of economic growth in the period since 1994 has been 4-5%, exceeding the median growth rate of Sub-Saharan African countries (2.5%). Mali’s export income is based on three commodities: gold, cotton, and livestock. Industry in Mali is focused on processing agricultural commodities. In 2002, only 2% of the active population was employed in the formal sector (World Bank 2009a; Bermúdez-Lugo 2008; FAO 2005a; USDOS 2008; GOM 2002; UNICEF 2010; OECD 2005). The country has distinct ecological regions: (1) the Sahara desert in the north; (2) the arid and semi-arid Sahel that stretches across the middle of the country; (3) the freshwater wetland of the Niger Delta; and (4) the humid forests in the southern tip of the country. Less than 4% of Mali’s land area is arable. Agricultural land constitutes 32% of the land area, but 87% of this is used as pasture. Ninety percent of arable agricultural land is cultivated by small-scale farmers, and most of the cultivated land (72%) is devoted to cereals, and millet and sorgum are staples. Mali is one of the more food secure countries in the sub-region because of its production of rice, millet, sorghum, and other grains. In peri-urban areas, fruits and vegetables are the primary crops, and large irrigation schemes managed by the Office du Niger produce rice. Only 5% of cropland is irrigated. Rice has become the urban staple, and Mali imports on average about 20% of the demand. Between 70-75% of households are food-secure during both the post-harvest period and the “hungry season” (World Bank 2009a; World Bank 2010a; USDOS 2008; FAO 2005c; GOM 2002; USAID 2010b). Forest area is 10% of the land, and the annual deforestation rate is 0.8%. Nationally protected areas cover 2% of the total land area (World Bank 2009a). The Niger Delta covers about 30,000 square kilometers and floods between five and six months of the year. About 1.5 million people live in the Delta, and their livelihoods are based on a mix of fishing, cultivation, and livestock-rearing. The Delta is surrounded by drylands with diverse landscapes and natural resources. Production systems, such as livestock-rearing, involve both the Delta and dryland zones, with a variety of resource users following seasonal and annual patterns of use. Multiple users of limited resources that vary in quality and quantity over time depend on cooperation and agreed principles of behavior and land use (Konate 2003). For several decades, pastoralism was blamed for destroying the Sahel region through overgrazing. Today scientists largely agree that pastoralists are efficient resource users, that the Sahelian pastures are resilient, and that climate has a greater impact on vegetation than livestock. Nevertheless, where herd mobility is constrained for a prolonged period of time, land degradation has occurred (Cotula 2006). Mali’s largest ethnic group is the Mande language group (including Bambara, Soninke, and Malinke) which makes up 52% of the population; other groups are Fulani (11%, including migrating Fulani from Mauritania), Mianka (4%), Saracolé (7%), Songhai (7%), and Tuareg and Maur (5%). Numerous smaller groups make up the balance of the population. Historically, the various ethnic groups were associated with specific occupations and regions: members of the Mande language group were primarily farmers, residing in the central and southern regions; the Fulani, Maur, and Tuareg were herders, residing primarily in the northern regions and migrating; and the Saracolés were traders, with their home bases in urban areas. These ethnic-occupational classifications have become less distinct over the years with urban migration and mixed livelihoods (Library of Congress 2005; FAO 2005c). Mali has approximately 800,000 farms. Sixty-eight percent of farmers work on less than five hectares of land; 86 percent cultivate less than 10 hectares. Most of the smallholders are subsistence farmers, producing corn, millet, and sorghum for consumption. In southern Mali, the traditional practice of large groups controlling a system of big fields has transitioned to smaller family units, often ranging from 10 to 20 people controlling smaller fields. Across the western African Sahel region, virtually all agricultural land is claimed by groups or individuals (World Bank 2010a; Benjaminsen 2002; Cotula 2006). The livestock sub-sector (estimated in 2005 at more than 15 million cattle, sheep, goats, and camels) has highly concentrated ownership: 43% of producers own 6% of the herds. Most of the livestock is kept in the semi-arid south-central region of the country. Ten percent of the population are nomadic herders, primarily living in the northern arid region of the country and following a seasonal migration pattern. Pastoralists migrate south from November to January, returning north from July to September of each year. Transhumance stock-rearing is associated with rainfed agriculture. Pastoral communities move from southern agricultural areas when the rainy season begins into northern areas. As the water-points dry up in the north and northern pastures are depleted, the herds return south, feeding on crop residue and byproducts. Cropping and livestock-raising occur simultaneously in the agro-pastoral zone of the internal Delta of the Niger River. Depending on the reliability of rains, cultivation dominates in some areas while in others livestock dominates (FAO 2005c; World Bank 2010a; Oxfam 2009). Successive years of drought, expanding areas of cultivation, and increased numbers of sedentary farmers keeping livestock have eroded clear distinctions between pastoralists and sedentary farmers. Many former nomadic herders have become less migratory, keeping their livestock in home pastures and diversifying into crop farming and other income-generating activities. In some areas, formerly sedentary farmers such as the Sonike invested in livestock when other assets lost value, and have become primarily herders (Beeler 2006; Djiré 2006; Chenevix-Trench et al. 1997). 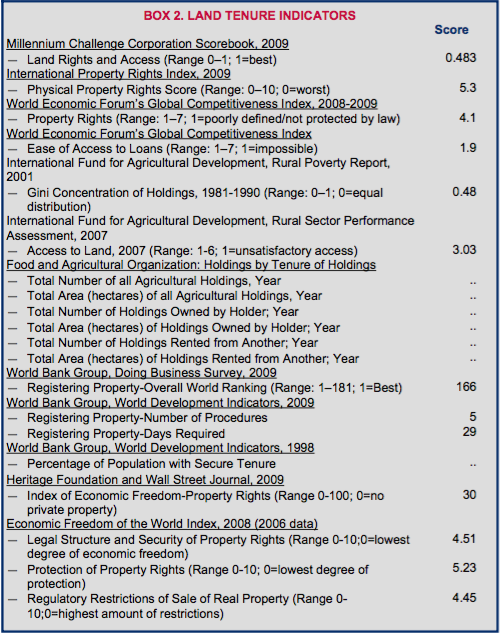 The formal law governing land rights includes: the 1992 Constitution of the Republic of Mali, which guarantees citizens the right to own property and provides for the protection of property; the 2000 Land Code, as amended (Ordinance No 00-27/P-RM of March 2000 Pertaining to the State Property and Land Code); and the Agricultural Orientation Law (Law No. 06-045 of September 2006). The Land Code recognizes state land, land owned by individuals and entities, and use-rights to customary land held by groups and individual group members (GOM 1992; GOM 2000). The Pastoral Charter (Law No. 01-004) was passed in 2001 and its implementing decree in 2006. The Charter recognizes pastoralism and the right of pastoralists to move their livestock and have access to natural resources to support their livestock and livelihoods. The Charter requires local authorities, who have primary responsibility for managing pastoral land, to work with pastoralists, traditional authorities, and farmers to maintain pastoral tracks and paths, create calendars of use of natural resources, and prevent encroachment of pastoral land. Under the Charter, development projects and programs must be designed to take pastoralists’ needs into account and preserve pastoral land and resources (GOM 2001; Konate 2003). Law No. 95-034 AN-RM of 12 April 12 1995 gave local authorities (the Regional Assembly, the Circle Council, and community councils) responsibility for land administration, land-use planning and development, and organizing rural activities, including agro-forestry-pastoral production (USAID 2008). As a practical matter, customary law governs land rights in much of Mali, particularly the rural areas. Customary tenure administrative systems continue to be the primary mode of land administration in rural Mali (Benjaminsen 2002; Djiré 2006; Cotula 2006). Under the Land Code, land is classified as either state land or private land. State land includes all public property (e.g., roads, public buildings, large surface water sources), land titled in the name of the state or transferred to the state, and all unregistered land, including vacant land. State land includes land granted to individuals or entities on lease or concession, and land on which customary use rights are exercised. Private land is land titled and registered in the name of an individual or entity in accordance with formal law (GOM 2000). Ownership. An individual or entity can obtain ownership of land by obtaining the land title and registering the title with the state. A group – which includes residential lineage groups, villages or nomadic fractions (a sub-communal entity recognized in the Mali Decentralization Code but without legally recognized autonomous authority) – can apply for title to customary land. Individuals can apply for title to customary land based on their actual use of the land (GOM 2000). Leasehold. The state can lease its land to individuals and entities for periods of 50 years, or as otherwise agreed to by the Council of Ministers and the lessee. The state can also enter into a purchase agreement with a lessee, allowing for the transfer of ownership of the land following registration (GOM 2000). Rural concession. The state can grant rural concessions to unregistered state land. If the land on which the concession is granted is subject to competing customary use-rights, customary users may be compensated for the expropriation, assuming that they can establish their customary rights, are aware of their right to compensation, and are able to navigate the process successfully. Concessionaires must develop the land in accordance with the concession document; the concession is conditional upon the agreed development within an established timeframe (GOM 2000; Djiré 2006; Djiré 2007). Permit rights. The state and local governments can issue occupation permits to urban land to individuals. The occupation permits allow residential use of the land. The occupant is bound by the terms of the permit. The state also issues various types of permits to individuals and groups for cultivation of irrigated land, particularly where the land is under a publicly funded irrigation scheme (GOM 2000; Djiré 2006; Djiré 2007). Use-rights to customary land. The Land Code recognizes the rights of groups and individuals to use unregistered land. The group and its members have authority to enter into agreements with third parties, but customary rights to use the land can only be transferred to individuals within groups with the same customary rights (GOM 2000). Use of land by pastoralists. The Pastoral Charter provides that community bouroutieres (natural pasture) and fallow land are open-access resources for pastoralists, although use can be prioritized in accordance with custom and local management, and fees for use may be assessed in some circumstances. Livestock may have access to cropland after harvest, subject to terms imposed by local authorities (GOM 2001). Customary law varies across the regions and ethnic groups, but general principles of customary law recognize the right of clan and community members to access land for a residence and for farming (Djiré 2006; Benjaminsen 2002; Beeler 2006). Under formal law, individuals and entities can own and transfer land in Mali, and the Land Code allows holders of concessions and leases to convert their rights to ownership interests. However, the lack of knowledge of their rights, illiteracy, and the cost and complication of the procedure to obtain and register a title deed exclude most people – and particularly the rural people – from land ownership. In one rural commune, for example, roughly 40% of land titles were issued to Government officials, 35% to the state itself, 19% to private businessmen, and only 1% to small-scale farmers. The majority of the population obtains, holds, and transfers land under customary law; formal law in turn recognizes customary use-rights (UN 2006; Djiré 2006; GOM 2000). Under customary law, land is obtained by the following means: (1) founding or conquering a village; (2) inheritance; (3) gifts and loans; (4) leasing and sharecropping; (5) pastoralists’ exercise of use rights. Historically, pastoral tribes depended on the goodwill of sedentary farmers for access to grazing land and watering-holes. Many historically nomadic tribes are now only temporarily transhumant or semi-transhumant (only a few family members take the stock while the rest are sedentary). Pastoralist rights of access and use of natural resources are currently governed by the terms of the 2001 Pastoral Charter, to the extent recognized and enforced by local authorities (GOM 2001). Distribution of customary use-rights and control over rural land is largely based on village authorities, with land chiefs (ninge folo) allocating land. The land chief’s authority is usually based on residential patrilineage, where authority passes to the eldest male descendant of the founding lineage of the village (Benjaminsen 2002; Cotula 2006). In urban areas, residents generally build housing in informal settlements, without formal claim to their land. Many of these settlements have developed on land traditionally controlled by chiefs. Over 90% of Mali’s urban population lives in slums. Land tenure is very insecure and, as a result, investment in urban land is limited. Twenty-two percent of urban residents lack access to improved drinking water, 71% lack household connection to improved water, and 41% lack improved sanitation coverage. Mali’s urban population is expected to grow 4–5% per year through 2030 (GOM 2006; UN-Habitat 2007; UN-Habitat 2005; World Bank 2002). Particularly for poor and marginalized groups, lack of access to the formal legal system (resulting from illiteracy, lack of experience with government institutions, and lack of financial means to travel to courts), gaps and inconsistencies in the legal and administrative framework, and institutional deficiencies create land tenure insecurity. Formal laws, such as the 2001 Pastoral Charter and 2000 Land Code, are inconsistent among themselves and inconsistent with customary laws, which have more social legitimacy. The parallel systems allow those with knowledge, sophistication, and resources to select the most advantageous law and institutional channel. Rural individuals often lack knowledge of the laws and legal processes, rarely have the financial resources to assert their rights, and lack physical access to formal institutions and tribunals (Cotula 2006; Djiré 2006; Djiré 2007; Kassibo 2004). The Land Code requires each of the 703 communes in Mali to set up a land register and conduct a land inventory. Registration of land in the capital involves five procedures that on average require 29 days. The average cost is 20% of the value of the property. The time required may be far longer in rural areas. Implementation of legislation governing land registers has been limited by several constraints, including: the relatively high cost of registration; the absence of reference to customary rights in the law; and the complexity of the procedures and high cost of undertaking the process (World Bank 2009b; Djire 2006). The Constitution prohibits discrimination on the basis of gender and provides that all citizens have the rights to own land. Mali has a policy to promote women and acknowledge and strengthen their rights, but the status of women has not improved due to poor legal awareness and persistent sociocultural norms (GOM 1992; GOM 2002). Family laws tend to favor men, requiring a specific writing to confirm community property in marriage and presuming polygamous marriages unless otherwise stated. Women’s lack of education and cultural restrictions impede access to legal services (USDOS 2007). Women are sometimes given use-rights to land, usually through loans of unspecified length and more rarely through gifts of land. Village chiefs may give widows use-rights to land. Women with resources can purchase land, and some development projects provide women with opportunities to obtain rights to land in their own name (Djiré 2006; Chauveau et al. 2006; Benjaminsen 2002; FAO 2005c; Cotula 2006). Under customary law, women are excluded from inheriting land from their natal family because they are expected to leave the family at the time of marriage. Once women have married, however, they are also barred from inheriting within their marital family because they may return to their natal family (Djiré 2006; Chauveau et al. 2006; Benjaminsen 2002). The customary rights to land that women hold are usually not very secure. Women often voluntarily relinquish their use-rights to married sons. There are some cases, however, in court and customary forums, in which women have claimed their rights. In a 2002 court case in a rural commune, a landowner without male heirs died and one of his daughters claimed land from the deceased’s younger brother, who was selling off the land. The judge ruled that the defendant should transfer eight hectares to the daughter because, by putting the land on the market and making money, the younger brother had removed the “customary nature” of the land and, consequently, customary law did not apply (Chauveau et al. 2006; Hamilton and Dama 2003). The Ministry of Housing, Land Affairs and Urbanism was established in 2000. The Ministry is responsible for developing both urban and rural land policy and operating property-registration offices. The Ministry includes in its objectives: (1) improving the framework for consultation with stakeholders and users; (2) adopting and implementing legislation governing land, housing, and urban development; (3) implementation of the National Housing Policy and the building of social housing; (4) establishment of land information systems for the control of land and estate management; and (5) capacity-building and modernization of services to improve their effectiveness. Within the Ministry, the National Directorate for Public Property and Cadastre runs the property-registration offices. The Ministry established a land department (Etats Généraux du Foncier, EGF), which had as its overall objectives the development of a new land policy and the establishment of a fair, equitable, and sustainable system of land management that supports private investment and productive land use (GOM 2007a). In 1991, formal law devolved the power to endorse development and management plans for land, community forests, and other natural resources to 703 municipalities and rural councils. Each rural commune has prepared a Plan for Economic, Social, and Cultural Development (PDSEC). Law No. 95-034 AN-RM of 12 April 1995 gave local authorities (the Regional Assembly, the Circle Council, and commune councils) responsibility for land administration, land-use planning and development, and organizing rural activities, including agro-forestry-pastoral production). The ministry and local institutions have lacked reliable land data and capacity for land inventories and land administration. In many rural areas, land-use rights continue to be subject to customary rules, overseen and mediated by village chiefs (USAID 2008; Ogier et al. 2001; Cotula 2006; GTZ n.d.). The commune councils are elected bodies that govern rural districts populated with between 200–15,000 people. There is no legal requirement for representation of particular interests, such as pastoralists or women, on the improving the framework for consultation with stakeholders and users; on the commune councils. The Pastoral Charter, 2001, requires local councils to manage natural resources with the participation of pastoralists and other users of natural resources and to collaborate with pastoralist organizations in seasonal land use planning. The Pastoral Charter further suggests that communes form local management committees to help manage the use of natural resources (GOM 2001; UNCDF 2003). The Ministry of Livestock and Fisheries designs and implements national policies on livestock and fishing. The Ministry of Agriculture designs and implements the national agricultural policy and is charged with plant protection, development of agro-hydro equipment and public works, farming system improvements, and agronomic and biotechnological research development. The National Direction of Urban Planning and Construction, created by Ordinance No. 99-014/P-RM on 1 April 1999, is responsible for national policy on urban planning, housing construction, and urban parks and gardens (USAID 2008). Mali’s land market is characterized by a growing commoditization of land and increased competition among land users. The value of rural land varies widely based on location, proximity to infrastructure, and the type of crops it can support. In peri-urban areas, urban expansion and increasing demand for land have fueled the land market. Municipalities often expropriate peri-urban land in order to establish new residential areas. Urban elites have increased pressure on peri-urban land by buying land for investment and speculation. Urban and peri-urban areas have seen an increase in land titling and registration, especially in the vicinity of the capital, Bamako, where Malians living abroad returned after the 1991 regime change and began investing in property. Many urban elites have acquired land from the state through concessions, only to parcel off and sell the land to developers. (Benjaminsen 2002; Chauveau et al. 2006; Keita et al. 2008; Djiré 2007). The vast majority of land in Mali is not held in registered ownership, and therefore cannot legally be sold or purchased. Land sales and leasing in urban and peri-urban areas are almost always informal transactions because neither party has registered the land (and therefore does not have formal title). These transactions are usually made in writing to promote their security. The documentation of the informal land transaction provides evidence of the nature of the transfer and the parties’ intent. However, even if validated by local officials, these transactions are usually unofficial because they involve land that is not registered. The process also fails to protect all parties with an interest in the land: family administrators (often the elder brothers) can sell land without the knowledge of other rights holders (usually the younger brothers) or family members who depend on access to the land (such as wives, mothers, and daughters) (Djiré 2006; Benjaminsen 2002; Chauveau et al. 2006). The informal land market operates with local official or customary approval and oversight. In peri-urban areas, this informal land market is moving towards cash-based transactions in which all use-rights are exchanged. In rural areas, villagers often demand money when asked for land; these transactions are rarely intended as sales, however, but rather as an acknowledgement of an ongoing relationship and a temporary transfer of use rights (Keita et al. 2008; Chauveau et al. 2006). In some cases, the emerging rural land market presents new opportunities for women and immigrants to access land ownership, which under customary systems would otherwise be unavailable to them. Purchasers of rural land with secure private title are often urban residents or expatriate Malians. The owners rarely live on the land; more often they lend the land to third parties – often women and immigrants who lack access to land – as a method of developing the land for low or no cost. The new cultivators sometimes establish farms or orchards on the land, although their access to the land is rarely secure because landowners can sell the land without notice. In addition, the new cultivators may themselves dispossess others, such as when they clear land of native trees that local women rely on for fruit or exclude local residents from planting dry-season crops (Djiré 2006). The informal lease market developed as a result of the rehabilitation of irrigation systems in some farm areas. Prior to the investment in the irrigation systems and the attendant implementation of new farming techniques, there were few land transactions. As the farmland became more productive, its value increased. Likewise, as the country’s urban population has expanded, the land surrounding urban centers has become necessary for residential development. In these areas where land demand grew rapidly, the informal land market is vibrant (Chauveau et al. 2006). Under the Land Code, the government can expropriate registered property and customary land if necessary to the public interest and upon payment of just compensation. Public interest includes the development of public works, preservation of forests, and the creation of infrastructure for needs such as irrigation and drainage (GOM 2000; Cotula 2006). The procedure for expropriating registered land requires the landowners to identify all lessees, users, and other holders of land rights. The Ministry for Lands issues a public notice and notice to all those identified by the landowner as having rights to the land. The government is required to pay the landowners for the land expropriated; the landowner is responsible for making compensatory payments to any holders of derivative rights. Unless agreed to by the parties, compensation is determined by the court; parties can provide expert testimony on valuation and damages sustained (GOM 2000). If expropriation involves unregistered customary land, the state will conduct a public investigation to determine the existence of the customary rights and the holders of the rights. The compensation can be agreed to by the parties, or determined by the court in the absence of agreement. Multiple holders of customary rights can agree among themselves as to the division of compensation; if they fail to reach agreement, the court will impose a decision (GOM 2000). Disputes over land are a widespread problem in Mali. They take several forms, including: (1) within sedentary communities; (2) between generations; and (3) between different natural resource users. Within sedentary communities, conflicts usually occur when a family that lent land to another attempts to retrieve it, or when the borrowers start to invest on the land, which is considered an attempt to appropriate the land. Often borrowers plant fruit trees as a cheaper way to appropriate the land than digging a well or constructing a building (Benjaminsen 2002; Djiré 2006; Beeler 2006). Conflict can also occur when young or landless members within family groups fight for access to land (Couliably 2003; Beeler 2006). The most violent land conflicts, however, tend to be between herders and farmers. The expansion of land under cultivation can obstruct routes for livestock and waterholes and cause increased tension between the groups. In the past, herders were nomadic and farmers were sedentary, but today farmers often own livestock as an investment, and herders are semi-transhumant or temporary transhumants. Agro-pastoralists and herders now compete for the same resources (Hamilton and Dama 2003; Beeler 2006). Conflicts between two parties are often settled through negotiation between the parties or with the assistance of the village chief. If either side disagrees with the decision of the chief, the dispute can go to the local council, and from there to the formal courts. If the dispute is over livestock damaging crops, it is treated as a criminal case. For the past 100 years, there have been local annual conventions in northwest Mali to establish routes for livestock and manage water-points, but respect for these conventions is declining, creating the potential for conflict. Decentralization is often blamed in part for conflicts over land, as the process of giving political power to local bodies weakened the position of village chiefs and gave more influence to political parties (Beeler 2006; Benjaminsen 2002). The Pastoral Charter provides for local dispute resolution of issues regarding pastoralists. Local authorities are responsible for helping to prevent and resolve disputes regarding pastoralists’ use of land and natural resources. The Charter authorizes the local government to punish those who occupy or block pastoral land, move animals outside the pastoral track, or contravene established local rules regarding pasture access. The Pastoral Charter has not been fully implemented and there is limited information regarding the extent to which local governments enforce the Charter’s mandates, and the extent to which pastoralists actually participate in local governance of natural resources. However, isolated studies suggest that the nature of the relationships between communities and pastoralists continues to be highly localized. In some areas, local councils favor pastoralists, granting them land access over cultivators from nearby villages seeking to expand their cropping area. In other areas, the land available for pastoralists is increasingly restricted. The traditional offer of manure for land access has become less valuable as more farmers keep livestock, pastoralists are increasingly sedentary, and rain scarcity has caused cow dung to burn crops (GOM 2001; UNCDF 2003; Djiré 2006; Chenevix-Trench 1997). Mali has privatized state-owned operations, liberalized the financial sector, harmonized business law, and removed price controls on most goods. The 2001 Pastoral Charter and its implementing decree in 2006 introduced the concept of productive pastoral land use (USG 2008; GOM 2002; Cotula and Mathieu 2008; Kassibo 2004). Past government policies have at times produced unanticipated results. For example, the government’s open-access program for water-points and other infrastructure has actually increased tenure conflicts by undermining traditional restrictions and priority rights. The First Republic of Mali’s abolishment of sharecropping and grazing fees (in the 1960s) was intended to end exploitative practices, but led to conflicts and the degradation of natural resources (Cotula 2006; Chenevix-Trench et al. 1997). USAID focuses on increasing productivity in agriculture through assisting in privatization, including pursuing trade policy and private sector policy reforms. The agency also supports modest mechanisms to support the financial sector, such as irrigation funding investment guarantees. USAID’s agriculture expenditures in Mali were US $5.7 million in fiscal year 2007, US $4.8 million in fiscal year 2008, and an estimated US $38 million in fiscal year 2009). Total appropriations for fiscal year 2010 were: US $27 million for agriculture and related programming; US $2 million for biodiversity; and US $1.5 million for water (USAID 2002; USDOS 2008; USDOS 2009; USDOS 2010). The Integrated Initiatives for Economic Growth in Mali project (Initiatives Intégrées pour la Croissance Economique au Mali, IICEM) is the successor to the major trade, finance, and agricultural USAID economic-growth programs. IICEM has targeted five agricultural value chains (rice, mangoes, potatoes, shallots, and tomatoes), and strategic objectives including: expansion/rehabilitation of irrigated agriculture; intensification of agricultural production in target areas; and increasing control of village associations over natural resources and the environment. The project is assisting with development of resource-management plans, supporting agroforestry and sustainable farming techniques, training local NGO agents in understanding natural resource legislation, and providing technical assistance on natural resource management techniques (USAID 2008). The German Agency for Technical Cooperation (GTZ) is implementing a 7-year, EUR € 5 million Communal Land Asset Management Project (2003–2010) working with the Ministry of Government Real Estate and Land to provide institutional support and capacity-building to government offices on all aspects of land administration. The project, which created six model municipalities, is training state and municipal institutions in land inventories and land-registration techniques to assist in land-use planning, increase knowledge of the land market, and increase transparency in levying local taxes (Djire 2006; GTZ n.d.). France, the World Bank, and the International Monetary Fund (IMF) are assisting in major infrastructure investments. Several other countries provide bilateral support. The World Bank has supported projects to strengthen government agricultural institutions and agricultural infrastructure, build farmer capacity, improve farm production, and reform the cotton sector. The World Bank has also allocated funding for agricultural research. The Rural Community Development Project specifically targets agriculture, fishing, forestry, water, sanitation and flood protection (USAID 2005; USAID 2002; World Bank 2007). The Millennium Challenge Corporation has committed to a five-year, US $460 million compact to support policy reform and the development of infrastructure for productive sectors. One of the three projects funded is the US $235 million Alatona Irrigation Project, which focuses on a high-potential geographical zone within one of Mali’s poorest areas. The project is developing irrigated land and allocating that land in private ownership to small family farmers and women market gardeners. Some of the land will be awarded as compensation to families displaced by the project, and family farmers will purchase the remainder of the land, making payments over a 20- year period (MCC 2006). Mali’s civil society sector has grown in the last few years to more than 4000 associations. Some NGOs, such as the Malian Association for Promotion of the Sahel (Association Malienne Pour La Promotion Du Sahel, AMAPROS), help negotiate with traditional administrators for land-use rights for groups of women. Others, such as Jam Sahel, work on conflict management and roll out local information campaigns on land rights (Djiré 2006; Beeler 2006). The Decentralized Network for the Management of Natural Resources in the 5th Region (GDRN5) network was established in Mali in 1994 by three NGOs that pooled their efforts to address their shortcomings through training and exchanging information on natural resource management. The network has grown to include 24 national and international NGOs and associations. The goal of the network is to promote the emergence of sustainable natural resources management through the following objectives: (1) strengthening the technical and organizational capacities of members and their partners in natural resource management; (2) influencing local and national policies on natural resource management; (3) helping members and their partners to support democratic and decentralized governance of natural resources; and (4) helping members and their partners support the emergence of community and inter-community institutions. The GDRN5 provided input to the drafting of the Pastoral Charter (Konate 2003). The Inner Niger Delta is the largest inland wetland in West Africa, with annual floods bringing up to between 25,000 and 30,000 square kilometers of land into production. One of the Delta’s most prized resources is the grass burgu, which provides excellent dry-season pasture. Over a half million people live in the Delta, and the area claims 40% of the national cattle herd and 90% of the national fishing catch. Outside the Delta, there is a growing water infrastructure, but rainfed farming and pastoralism are still dominant. Mali receives an average of 282 millimeters of rain each year, ranging from more than 1200 millimeters per year in the sub-humid forest and woodland zone in the south (6% of land area), between 600 and 1200 millimeters per year in the central Sudan savanna (17% of land area), and between 200 and 600 millimeters per year in the northern Sahelian zone (26% of land area), to less than 200 millimeters per year in the Saharan zone in the far north (51% of land area). Just under 5% of Mali’s cultivated area is irrigated. The Office du Niger is a large-scale irrigation scheme established by the French in the 1930s and rehabilitated by the state in the 1980s. Only 12% of the country’s large irrigation potential is currently developed (Cotula 2006; Djiré 2007; GOM 2006; FAO 2005a; World Bank 2010a). Mali’s total renewable water resources amount to 100 cubic kilometers. Approximately 90% of the country’s water consumption is for agricultural purposes. Access to improved drinking water is higher in urban areas (78%) than in rural areas (36%). Household connections to improved drinking water are lower in both, at 11% of urban households and 2% of rural households. Only 59% of urban households and 39% of rural households have improved sanitation coverage (FAO 2005a; UN-Habitat 2007; GOM 2006). The 2002 Water Code (Law No. 02-006) and 2000 Land Code specify that the state owns all water resources with only limited exceptions for smaller bodies of surface water. The state owns all groundwater. The Water Code regulates the use, conservation, protection, and management of water resources. The Water Code requires permits for extraction of water, with exceptions for water used for domestic purposes and in amounts below specific volumes. The Water Code prohibits discharge of substances that may negatively affect water resources. Under the Water Code, local governments are responsible for water supply (GOM 2000; Cotula 2006; USAID 2008). The Pastoral Charter, which governs use of natural resources by pastoralists, provides free access to rivers, ponds, and lakes in the public domain for watering animals. Pastoralists are responsible for respecting the rights of others and using water in a manner that does not abuse or waste the resource. Access to private and traditional wells is subject to permission and terms imposed by the owners (GOM 2001). In the arid northwest region of Mali, livestock traditionally had free access to water-holes and wells during the rainy season. In the dry season, incoming herders pay to water their livestock at water-holes or wells. In some areas, pastoralists themselves dug wells, to which they had priority access rights. After Independence, the government of Mali with the help of donors introduced de facto open-access water infrastructure, to which any incoming pastoralists had rights of use. Rather than being based on traditional rights and negotiated agreements, securing access became a matter settled by force or privatization by local elites (Beeler 2006; Cotula 2006). In the Niger Delta, customary land managers (jowro) were responsible for regulating the number of livestock that passed through an area, providing access to water resources, and collecting fees. After Independence, the state terminated regulation of grazing land and payment of grazing dues (in addition to creating the open-access system). The jowro still exist and continue to charge fees for access to some resources. Some jowro continue to act on behalf of the communities they serve; others have used their position to become private entrepreneurs (Cotula 2006; Maiga and Diallo 1998). On land funded by public irrigation schemes, farmers have conditional land-use rights, dependent on paying water fees and using the land productively. In the Office du Niger, there are different types of contracts, including farming contracts and farming licenses. Farming contracts have a duration of one year, are renewable, and are subject to productive use, conservation measures, and payment of a water fee. Farming licenses are meant to provide greater tenure security because they are of indeterminate duration. A farmer can apply for a license after two years of cultivation. Licenses are inheritable and, if withdrawn by the state, the state must pay compensation unless withdrawal is in response to a violation of licensing conditions. Nonetheless, a 2000 study showed that fewer than 10% of farmers had applied for licenses, because they did not believe the licenses provided substantially greater tenure security than the contracts (Cotula 2006). On irrigated land, the irrigation agency can evict farmers the first time a water fee goes unpaid, regardless of the size of fee or history of payment. Farmers lose all rights and no compensation is paid. A lively informal land rental system has grown up in irrigated land, with farmers choosing to rent out their plots rather than losing them all together. The Office du Niger has begun offering special deals to private investors – renewable 50-year leases on non-irrigated land in return for building irrigation infrastructure – and selling irrigated land to large investors. This change of policy from state ownership of irrigated land can potentially lead to employment for existing farmers, or to their eviction (Cotula 2006). Rapid population growth is increasing competition for limited water resources, and people have established wells to try to strengthen claims over land and resources. The overlap of state and customary rules concerning access to water has in many cases caused disputes and conflict. In addition, as irrigation schemes continue to expand and more water-points are built, land values rise and competition for the land increases. Climate change may worsen the scarcity and erratic nature of Sahel rainfall, intensifying competition for water resources (Cotula 2006). The Ministry of Energy and Water Resources, which replaced the Ministry of Mines, Energy and Water Resources, oversees water for hydroelectricity and irrigation. Large-scale irrigation schemes are overseen by parastatal agencies such as the Office du Niger. The Commission of Regulation of Water and Electricity is an independent entity that works with the Ministry of Energy and Water to develop water and sanitation plans and ensure that mining operators respect regulations. The commission has the authority to impose regulations on any department, contracting authority, user, and legally recognized operator. The National Directorate of Water and the National Directorate for Environment are charged with overseeing efforts to improve drinking water and sanitation, respectively. The Ministry of Urbanism and Habitat is responsible for drinking water and sanitation in the urban areas (Reuters 2009; Cotula 2006; World Bank 2007; UN-Habitat 2009; USAID 2008). During the World Bank-initiated Structural Adjustment Programs of the 1980s and 1990s, state and parastatal organizations withdrew in large part from the direct provision and management of the water infrastructure. There was a substantial reduction in personnel in parastatal agencies such as the Office du Niger. Local committees made up of local government and user group representatives are intended to take a key role in managing water resources. Preliminary studies suggest that increasing farmers’ control over irrigation (especially in regard to tertiary canals, which are the end-point channels for delivering water to the farmers’ plots) has contributed to improved water-delivery and greater farmer satisfaction. The private sector is increasingly engaged in creating water-points and other infrastructure (Cotula 2006). As part of its strategy to promote poverty reduction through development of the agricultural sector, USAID supports development and maintenance of the irrigation infrastructure. USAID has funded the installation of nine irrigation pumps in northern Mali, and has facilitated the rehabilitation of major canals in critical areas. The Integrated Initiatives for Economic Growth in Mali (IICEM) project began in 2007 and is scheduled to end in September 2010. Since the project began, more than 4.3 kilometers of major canals have been resurfaced, which has improved water management and production on 1259 hectares of farmland (USAID 2010a). The World Bank provides support for a Rural Community Development Project, which focuses on agriculture, fishing, forestry, water, sanitation and flood protection. The total budget for the project is US $60 million, with approximately 5% allocated to funding for water, sanitation and flood protection. The Bank also provides support for ongoing development of the irrigation infrastructure through the Office du Niger project (US $240 million). This project was designed to restructure the Office du Niger and reform its irrigation policies, to modernize and rehabilitate irrigation canals, and to improve farmers’ incomes. Through the project, 57 kilometers of canals and drains were rehabilitated and modernized, water-fee collection rates increased from 60% to 97%, the financial standing of the Office du Niger improved, and farmer participation on water management committees increased (World Bank 2010b). GTZ supports capacity-building and institutional development of the local government entities in the decentralization of the administration of supplying drinking water to the people of Mali (GTZ 2009). Forest covers about 12.5 million hectares or approximately 10% of Mali’s land area. With other wooded land this makes up a total of 29 million hectares or 24% of the land area. Most of Mali’s forests are found in the semi-humid and Sudanian regions of the south. Within the country’s large ecological regions (Central Niger Delta, Gourma, Mandingue Plateau, and Iforas Adrar), about 1.2 million hectares are classified forest and 3.8 million hectares are faunal reserve. The country’s forests provide rural communities with fuelwood, timber for construction, food, fodder, and medicinal herbs (FAO 2001; FAO 2005b; GOM 2002; USAID 2008). Mali’s vegetative cover is diminishing by a minimum of 100,000 hectares per year. While the deforestation rate is approximately 0.8% annually, the annual forest degradation rate is as high as 8%. Primary causes for the degradation and deforestation include encroachment of agriculture, unsustainable resource-extraction and, to a lesser degree, climate change (USAID 2008; World Bank 2009a; Maiga 2008; Ashley 2004). About 2% of Mali’s total land area is legally protected, including six forest reserves, the country’s one national park and four wilderness reserves. Protected forests include Faira and Dioforongo, which encompass 3200 and 10,000 hectares, respectively. These forests comprise wooded and woodland savanna and light forest. However, Mali’s protected areas are often protected in name alone. Constrained management resources make protected areas difficult to safeguard, and government workers lack the equipment and financial support to properly protect the forests (USAID 2008; UNEP 2005; Ashley 2004). Under the 1995 Forest Code the state owns all “vacant” land, including forests and fallows older than 10 years. Individuals have rights to forests on land held under customary tenure. The 2000 Land Code includes forests within the public domain; equitable access is guaranteed, and gender-based discrimination is banned. Law No. 95-004 of December 1994 sets out the general conditions for conservation, protection and valorization of forestry resources in the national forestry domain, and defines protected zones (Wells 1999; Chenevix-Trench et al. 1997; Benjaminsen 2002; Djiré 2006; USAID 2008). The Pastoral Charter provides that pastoralists have access to unclassified forests without charge. Pastoralists are subject to general rules regarding environmental protection and natural stock management (GOM 2001). Historically, customary institutions regulated access to forest land and resources such as wood and fruit. The customary institutions, which usually operated at the village level, established rules of access, organized policing of the forest, and punished infringements by confiscating forest products and tools, levying fines, or ostracizing offending persons. Government decentralization and regulation has weakened customary institutions in many areas. However, in some areas the government is exploring strengthening customary institutions to play a role in local forest management (Chenevix-Trench et al. 1997; Benjaminsen 2002). The 1995 Forest Code identifies three types of forests: (1) state forests; (2) forests run by territorial communities; and (3) forests run by private individuals. The majority of forest land is owned by the state, although local rural councils are largely responsible for its management. The law imposes a tax on wood-harvesting and fines for cutting green wood without an official permit (FAO 2001; Benjaminsen 2002). In southern Mali, customary law provides that non-cultivated woods are open to use by communities and transhumant pastoralists. Visitors to the area seek approval of village authorities to collect fuelwood. Special fruit trees will often be considered the exclusive common property of the villagers (Benjaminsen 2002). The Ministry of Environment includes regional Offices for the Conservation of Nature (DRCN). The DRCN is the decentralized forestry service responsible for forest conservation, training agents in forest law, supporting village management committees, and providing technical assistance in forest management. Rural councils are intended to be legally responsible for the management of natural resources, including forests and woods, and they can delegate tasks to village forest management committees (Ogier et al. 2001; USAID 2007). Local farmer associations throughout Mali are involved in managing and guarding forest resources. These organizations are often involved in helping to settle conflicts. The GDRN5 provides one example of a coalition of local NGOs that have taken the initiative to manage natural resources in their region (Maiga and Diallo 1998). Mali created its National Biodiversity Strategy Action Plan in 2001. The plan promotes: (1) reinforcement of protected areas and their capacity to conserve biodiversity; (2) support for the sustainable management and rational use of biological resources; (3) valorization of traditional knowledge and practices; (4) safeguarding threatened local varieties of crops, plants, and domestic animals; and (5) reinforcement of the human capacity to preserve biological diversity. The strategy focuses on creating conditions to make it possible for local authorities to have the tools, training, and human capacities for effective conservation and sustainable use of biologically diverse resources (USAID 2008). Beginning in the 1990s, the GOM began reforming forest policy to include a greater role for forest resource users in forest management. However, decentralization from the central authority has been slow and resource users have not been fully integrated into forest management (Becker 2001; Ashley 2004). The Government of Mali aims to reduce wood-consumption through use of improved equipment and alternative fuel services. The government also intends to develop natural forests for energy uses and establish new forest plantings for charcoal (GOM 2002). The USAID Nuts Where They Fall project is a partnership with the Peace Corps to help preserve parkland and improve livelihoods through focusing on the preservation and marketing of the shea nut from the karité tree. The Peace Corps/USAID Initiative works with rural women in Mali to protect shea parklands, support the development of shea producer associations and cooperatives, disseminate information about the importance of adopting better post-harvest practices, and help to train and equip women to produce shea butter of exportable quality (USAID 2008). The World Bank’s Rural Community Development Project specifically targets agriculture, fishing, forestry, water, sanitation and flood protection. One such project focuses on biodiversity conservation in Gourma, a region in the Sahel characterized by lowland forests, lakes and dunes, as well as increasing desertification. Beginning in 2004, the project has focused on building capacity for decentralized natural resource management, supporting community-based biodiversity initiatives, and supporting inter-commune management of conservation areas. The total project cost is US $7.8 million (World Bank 2007). FAO is implementing a pilot project (2007–2010) designed to link Small and Medium Forest Enterprises (SMFEs) with national forest programs, emerging markets, and service providers (FAO 2009). Mining is of increasing importance to Mali’s economy. In 2006, mining accounted for 14% of the GDP. Within Africa, Mali is the third-largest producer of gold, which constitutes 80% of all mining activities and 65% of the country’s total exports. Mali also mines semiprecious stones, rock salt, sand, and gravel. The country also has vast undeveloped mineral resources, including bauxite, gypsum, manganese, and uranium (Bermúdez-Lugo 2008; UN 2006; Keita et al. 2008). The majority of Mali’s mineral deposits are found in the east and west of the country. Gold is primarily derived from the Kalana, the Morila, the Sadiola Hill, and the Yatela Mines, although fewer gold deposits are being found and ore reserves are in decline (USGS 2006; Cisse 2008). The mining sector is characterized by a lack of transparency. The sector suffers from endemic corruption, particularly in the allocation of mining rights and the negotiation of mining conditions. In recent years, international NGOs such as the International Federation for Human Rights (FIDH) and Oxfam America have published reports critical of mining activities in Mali and the government’s role in them. They express concern that the negotiating of Conventions of Establishment is faulty, that mining corporations are failing to respect environmental standards or worker conditions, and that the distribution of mining revenues has been unjust. Domestic NGOs have also expressed concern over the gap between profits of mining companies and the conditions for local communities (Keita et al. 2008). Increasingly, communities living near to mining operations have been displaced by mining interests, as is the case with villagers living in the communities of Sanso and Gouaniaka. Displaced persons are often promised jobs and community projects as benefits for giving up their land to mining interests, although these benefits rarely materialize, or prove to be unsustainable (Cotula 2009). NGOs have described the conditions of Malian mining sites as an ecological crisis. Many communities located near mining sites have been subject to environmental pollution due to marked population increases in regions with mining operations and the use of hazardous materials such as cyanide in mineral extraction. As of 2010, there had been no nation-wide study on the environmental impacts of mining in Mali (Cotula 2009; Keita et al. 2008; Belem 2006). The Mining Code of 1999 covers key aspects of mining operations, exploration and extraction; relations of mining rights holders with landowners and the state; and health, safety, labor, and related issues. The implementing decree for the mining code (Decree No. 99-255/P-RM, 1999) establishes the legal framework for gold mining activities. In 2006, Mali signed on to the Extractive Industries Transparency Initiative (EITI) and began building the institutional framework for the EITI in 2007. In April, 2010, the EITI Board accepted Mali’s request to extend its final validation past the initial deadline of 9 September 2010. As of 2010, Mali was not a member of the Kimberley Process Certification Scheme (Keita et al. 2008; Bermúdez-Lugo 2008; EITI 2010; Kimberly Process 2010). Neither the Land Law nor the Mining Code makes provision for communities to claim rights to subsoil resources or to scrutinize mining activities on local land (Keita et al. 2008). The state owns all minerals in Mali. Corporations, including foreign corporations, can obtain both exploration and exploitation permits. Exploration permits, issued by the Ministry of Mines, grant exclusive title to an area in which to conduct exploration. These are valid for three years and are twice renewable. Applicant corporations must demonstrate sufficient levels of technical and physical capacity. Exploitation permits, granted by the Head of Government, are required prior to mining within an exploration area and are only granted to companies that hold exploration permits or that have been authorized to prospect. Exploitation permits grant exclusive rights to exploit the mineral deposits within a specified area for 30 years. Prior to granting an expropriation right, the State requires the applicant to establish a new company under Malian law, with a 10% free-carried state share. Rights to prospecting and exploration are movable, while rights to exploitation are immovable and provide limited property rights (Cisse 2008; Keita et al. 2008; UN 2006; Anglogold 2008; GOM 2007b). All mining titles except exploration permits are accompanied by a Convention of Establishment, which defines the rights and responsibilities of the state and the holder of mining rights. An application for a mining permit must be accompanied by an environmental impact assessment. The state has minority holdings in many mining operations, but the majority of holdings are in private hands. Under the 1999 Mining Code, if the landowners or customary rights holders of land on a prospective mining site withhold their consent for mining, they may be obliged to allow the mining in return for prior and adequate compensation (Keita et al. 2008). A Ministry of Mines was formed in April 2009. The new Ministry split out of the former Ministry of Mines, Energy and Water. The National Directorate of Geology and Mines (Direction Nationale de la Géologie et des Mines, DNGM) screens investors for mining and oversees mining activities (Bermúdez-Lugo 2008; Reuters 2009; UN 2006). The Government of Mali (GOM) revised the Mining Code to stimulate investment in the mining sector. Through the revised Code, the GOM plans to expand mining exports, strengthen the capacity of women’s groups, and organize small-scale mining within the formal mining sector (UN 2006; GOM 2002). Local civil society groups and international NGOs have been monitoring mining activities and working with local communities to understand their rights (Keita et al. 2008).